The sky – an open treasure chest whose riches have been a source of wonder for mankind. Once the sun sets and darkness clutches the earth, thousands of clear sparkling gems adorn the sky. The stars have helped man to orient himself not only in place but also in the passing of the seasons of the year. Their dazzling beauty has been the source of myths, stories and legends and of questions to which only now mankind is beginning to find answers. But stars are not the only nocturnal objects that have intrigued philosophers. At night, when the sky has escaped the blinding glare of the sun, other lights in the sky can appear and take one’s breath away − a most impressive and magnificent sight − the aurora borealis or the so-called “northern lights”. Ancient Greek and Oriental sources mentioned this mysterious phenomenon of nature, but of course were perplexed as to its origins. Aristotle surmised that the northern lights were atmospheric gases that had ascended and ignited on high, while the Roman philosopher Seneca thought that they were evidence of a huge hole in the sky. In Europe during the Middle Ages the prominent appearance of these lights caused fear because it was considered a harbinger of wars, epidemics or other punishments from God. In more northern countries, where the lights were more often seen, the phenomenon did not cause apprehension but rather was woven into local folklore and mythology. 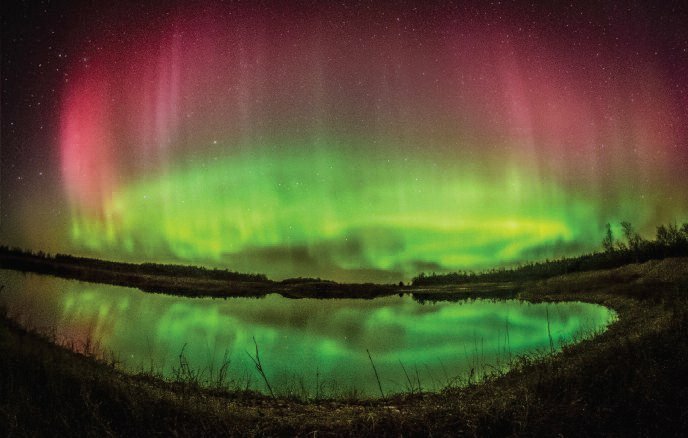 Physicists began guessing at the origin of the northern lights some time ago. In 1896, the Norwegian physicist Kristian Olaf Kirkland carried out laboratory experiments that suggested their magnetic nature. Subsequently, a half-century would pass before modern science would definitively establish their cause. Powerful thermonuclear reactions occur constantly in our sun, resulting in ejection of streams of electrified particles called the ‘solar wind’. The solar wind ‘blows’ constantly, but when electromagnetic activity at the sun’s surface increases, the sun can spit out enormous amounts of electrified particles weighing as much as a billion tons. The magnetic field around the earth protects our planet from the solar winds. Without this magnetic shield the earth’s atmosphere would be torn asunder and our earth would become a desert wasteland similar to Mars. When ex posed to powerful solar winds, the lines of the magnetic field of the earth can be interrupted, and then so-called magnetic storms can arise. During these storms the energyladen particles that have traveled from the sun enter the upper layers of the atmosphere and come into contact with the atoms of our atmospheric gases. The gases absorb this energy and then release it, shining it out in the form of light. The region where the particles of solar wind interact with the atoms of atmospheric gases has the form of a ring and is called the oval of the northern lights. In the northern hemisphere, when there are no magnetic storms, this oval covers the northern regions of Scandinavia, Russia, Canada and Alaska. The northern lights can be seen there almost every night. However, during magnetic storms, the diameter of the oval increases significantly and the northern lights can be seen much further south. It has been determined that in the plains of Lithuania they appear on average once every two months. That does not seem to be a very large number, and if we factor in the number of clear nights during the year, the number of appearances of the northern lights would be even smaller. However, even though the number is small, it is not equal to zero! Thus, if you know when and where to look, you don’t have to travel far to the north to see this awesome spectacle! Of course, the clarity and beauty of the northern lights in the skies of Lithuania rarely equal that which delight the inhabitants of more northernly situated countries. In Lithuania, most often one sees only a milky white glistening on the northern horizon, and the human eye cannot differentiate its colors. However, with digital photography one can display their full beauty. Long exposure photographs can be taken to collect large amounts of light even during the darkest nights. Such specially obtained photographs will reveal the weakest stars, and also, the beautiful colors of the northern lights and their constantly changing form. I captured my first northern lights completely by chance during the summer of 2013. I was photographing the descending Milky Way near Rubikiai Lake. At that time I was not paying attention to the northern horizon. It was only when I loaded the pictures into my computer that I noticed a rose sparkle at the edge of the picture. I was hugely disappointed when I realized that I had missed an amazing natural phenomenon which I had not yet seen outdoors. The same thing happened to me next time as well. I was again photographing the Milky Way when I noticed strange columns of light dancing on the northern horizon. However, I sincerely believed that it was an illusion, and I did not change my photographic location. When I got home and saw that I had again captured the northern lights at the edge of the photograph, I realized it was not an illusion and that I had again missed an opportunity to capture the northern lights in all their beauty. After these learning experiences I began to look at the northern horizon very intently. The situation repeated itself during the summer of 2014. I was photographing a completely different part of the vault of the sky when the sky above the northern horizon began to pulsate. After a while, long columns of light appeared and began to move in random directions. At first I could not believe what I was seeing, but at the urging of a girlfriend I stopped photographing and checked to see what in fact was happening there. I was overjoyed when my camera revealed the actual colors of the sky, and I was convinced that I was seeing the northern lights of my dreams. The feeling I had watching them was simply magical. Even though I could not make out all the colors, I could clearly see how the white columns of light appeared unexpectedly, how they moved quickly on the northern horizon and suddenly disappeared again. The sight made me jump for joy. After this happy coincidence I began to study what is needed to capture or to see the northern lights from Lithuania. Obviously the most important thing is to know the date and time when the northern lights might appear. This requires following predictions of the appearance of the northern lights. I personally use two Internet websites. The first is http://spaceweather.com. This website is not very accurate, but it does announce in advance when outbursts of electrified particles from the sun are headed to earth. This allows one to anticipate the appearance of northern lights several days in advance. Of course, no one can know precisely what will occur once the solar outburst reaches earth. However, if a very powerful out burst has been detected, it’s almost a guarantee that northern lights will appear within a few days. Once the electrified particles reach earth, I turn to another website, a more accurate one: http://auroraservice.eu/aurora-forecast. It shows the strength of the northern lights in real time. At both websites it is important to pay attention to what is called the Kp index. This index shows the strength of the northern lights on a numerical scale from 0 to 9. When Kp=0, this means that there is no northern lights activity, and it is impossible to see them anywhere on earth. If the index reaches 5, this means that a magnetic storm has begun. The larger the Kp index (and the stronger the northern light activity), the further south they are visible. According to the information given by the websites, northern lights can be observed in Lithuania when Kp=7. Magnetic storms of such intensity are relatively rare. However, if the weather is especially clear and the moon is not shining, and if you are very far away from city lights, you can observe even the smallest changes in the northern sky. These conditions came together for me in August of this year. Then I watched very weak manifestations of the northern lights for two nights in a row, when the Kp index was less than 4! That kind of magnetic activity occurs often. I saw a weak brightening in the northern horizon and white columns of light, which occasionally appeared. 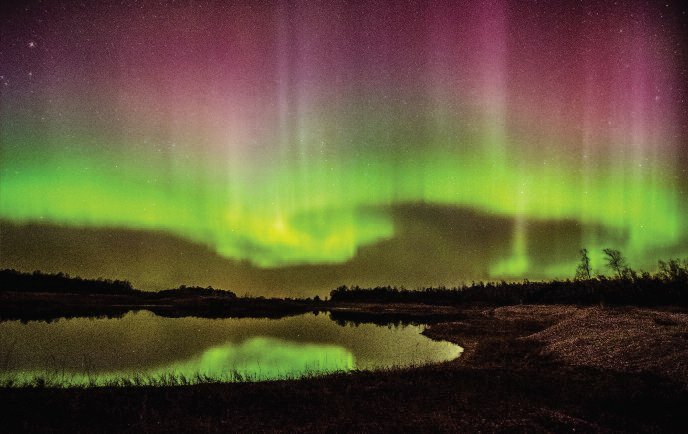 My camera captured them, and they appeared no less impressive than during a magnetic storm. The next night I brought my friends to the same place in the Biržai region, a place not ruined by city lights. I wanted to show them how impressive the sky was at that time. I photographed the northern horizon without any expectation that I would see anything there. When I saw what my camera had captured, I chuckled and told my friends – look, the northern lights are shining. No one believed me until I took another photograph and showed it to them. 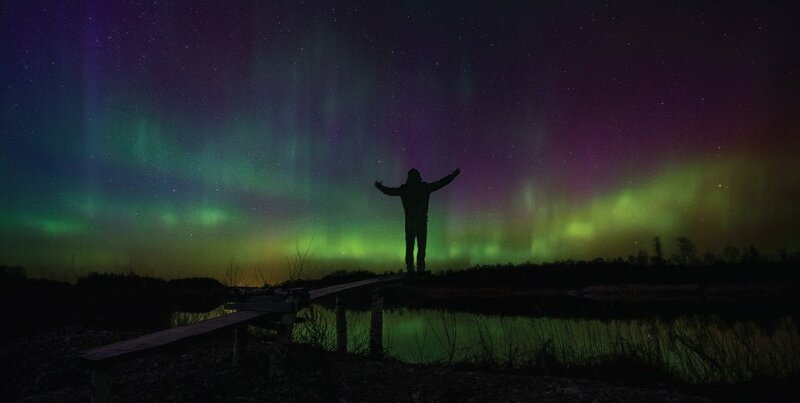 Me standing in front of very strong aurora display. The light seemed to penetrate my entire body. Veleniškiai quarry, Biržai region. March, 2015. You are undoubtedly feeling discouraged because it appears that the northern lights are practically unobservable in Lithuania without a camera. My friends felt the same emotion. However, one should not get discouraged because that is not all that can occur in the Lithuanian sky. This year, during the night of March 17th to March 18th, a very powerful cloud of electrified particles cut into the earth. The collision was so strong that the strength of the magnetic storms created exceeded Kp=8. That means that the northern lights extended so far south that they were visible in Lithuania above your head! 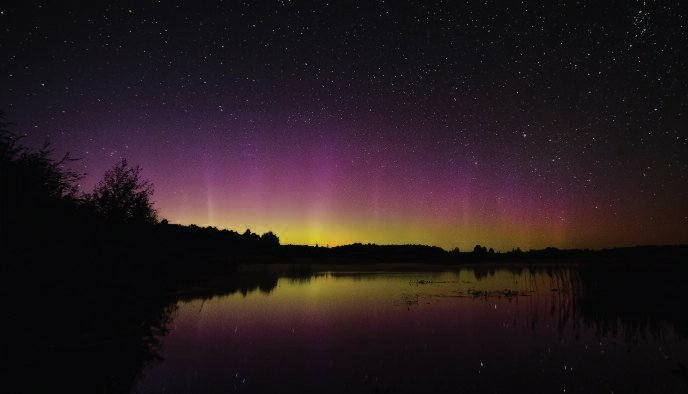 At that time, snake-like lights coiled in the northern horizon all night, and columns of rose-colored light danced, extending themselves all the way to the zenith. It was a real visit of the northern sky to Lithuania. I and many others could not sleep all night. The sight made us dizzy and we did not need a camera to see the colors at all. Tadas Janušonis is a great admirer of the night and of nocturnal photography. More of his photographs can be found at https://www.facebook.com/GemsInSky. 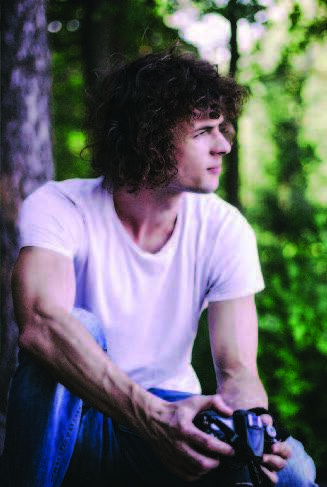 Also, short films made from his photographs can be viewed at: https://www.youtube.com/user/Topazzas/videos. 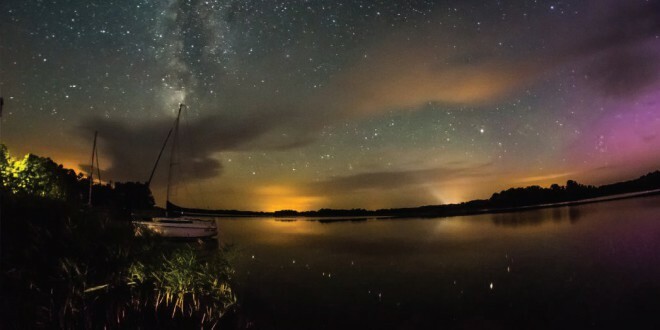 The last film, entitled “Dance of the Nocturnal Lights” shows predominantly the northern lights captured in Lithuania. Sometimes the columns of light glittered in such a blinding way that it seemed that the light was penetrating your entire body. It was an unbelievable and unique nocturnal experience. One can only naively hope that a magnetic storm of such magnitude will come again, because sunspot activity is projected to decrease in the coming years and ebb to a minimum by the year 2020; thus, there will be fewer and fewer magnetic storms. However, even if we experience a weak dance of light, our efforts will be rewarded over and above our expectations.